I’ve been craving pizza for the last few days, but it’s just not worth the calorie value (most of the time) so I was happy to find this 200 calorie DiGiorno pizza in the frozen section at the supermarket a few days ago. And yesterday I was looking for a snack that would satisfy my desire for junk food so I was happy when I found this little pizza in the freezer. I don’t think it would be filling on it’s own, but like most things it was satisfying when I added vegetables. 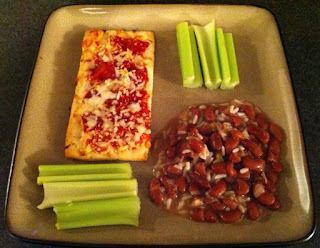 I popped it in the oven for 12 minutes, added some celery and red beans with a touch of rice (random, I know…but so delicious) and had a quick and tasty high protein meal. My snack turned into dinner. The little pizza isn’t gigantic, but it was enough to settle my craving, and to my surprise, it had 10 grams of protein. I loved that post workout! I’m not sure if there are other flavors available, but I’d like to find out. I’ll definitely be eating the pepperoni again. Do you have a favorite go-to snack/meal? Have you tried the DiGiorno single-serving pizza? If so, what do you think of it? What is the tastiest thing you’ve eaten this week? I Did What I Said I’d Do! 1 English muffin sliced. Top each half with a slice of fresh tomato, a few jalapeno peppers and a little cheddar cheese. Cook in the oven until hot and bubbly! I know what I'm having for lunch today! I wondered if those were any good. I will have to get a few for the freezer! I make up pita pizzas and freeze them, so they're always there for a quick snack or a small meal. I cut the pita in half so it's a really thin crust, which is what I like, add turkey italian sausage, onions, garlic, mushrooms, sauce and cheese. Yum! A pita sized pita for around 250 calories. That with a diet A&W root beer is the best! I haven't tried those pizzas but it looks so good on your plate that I think it's going on my shopping is!! My favorite snack lately is veggies and hummus….or I love the Green Giant for One veggies. I picked up the Supreme version of these 200 cal pizzas and it was pretty good. Like you, I had to add something to the meal to make it complete (salad). Not bad, plus I have a bunch of $1 off coupons, lol. I need to get that pizza for my pizzaholic husband! Thank you! Currently, my fave snack is lightly sea-salted almonds. For some reason, they really curb my hunger. But my go-to "snack" which I sometimes use as a meal are protein shakes. Oddly enough…the ones the weight lifters use. LOL! I feel silly drinking them, but they get that sweet-crave outta my system and fill me up. Trader Joe's has some good mini-pizzas that are about the same calorie-wise; in fact, I just had one today for lunch with a salad. Pizza is one food that I could eat everyday, 4-5 slices a meal, so having a less unhealthy/triggering alternative hanging out in my freezer has been sooo helpful! They should give you free stuff for talking about them on your blog because I am going to buy soem now. I use the Smart Ones mini-pizzas for a snack or two for a quick dinner with a veggie side. I'll be on the lookout for that DiGiornio single serve pizza! I had no idea DiGiornio had single serving pizzas. I haven't had pizza since I started WW 18 weeks ago. And maybe that's a good thing since I've had it quite a bit before but maybe as a treat. I've come to enjoy hummus with celery & carrots and Laughing Cow Light Swiss Cheese with apples. I, sadly, crave mostly sweets. My solution now is a banana, sliced with 2 tbsp of condense milk. Not the best but it keeps me in check and I'm eating a fruit. Also salsa and whole grain chips are a good way to keep in check for me. I just came across your health and fitness blog. Your article about a new snack to eat while dieting was especially interesting. I especially liked your comments about eating a healthy snack that still tastes delicious. I am adding you to my favorites. Since you and your readers are interested in health and fitness, we thought you would like to check out our ab workout machine called The AbStand. The AbStand is a full-body workout machine that provides an easy way for you to keep your New Year's resolution! Any feedback would be appreciated as well. Thanks! Frozen yogurt and a garlic bread for meal will do for a snack. If I am craving for sweets, I tend to divert my sweet tooth into fruit indulgence rather than chocolates. Losing weight is an extra effort you need to do. A lot of discipline as well. So we need to be wise what meal or snack to choose.